This heart-wrenching novel follows David, a young boy in WWII England who is struggling with his mother’s death and his father’s remarriage. David turns to books to deal with the extreme changes in his life when suddenly the books begin whispering to him in his mother’s voice. As David follows the voice he ends up in the land of fairy-tales, only it is warped and much darker than anything Grimm could have written. As a television show the audience would get a chance to explore the macabre fairy-tale world that seems to “take” children as David searches to save his mother and restore his life to its original state. It would also be nice to see a show that’s set in the fairy-tale world that actually has some darkness to it (here’s looking at you Once Upon a Time). This popular book series has been made into a film twice, in Sweden the entire series was made into three movies but in North America only the first book made it to the big screen. This popular thriller mystery series featuring the fierce investigator Lisbeth Salander and once-famous journalist Mikael Blomkvist as they solve (and later become accused of) murders and disappearances actually did very well in the box-office, though much better in Sweden where the book series is set than it did in North America. Once again, a television series would have been a fantastic choice for the book series as it would have allowed a more detailed look at the cases Salander and Blomkvist were trying to solve as well as a deeper look into the protagonists (particularly Salander’s) dark pasts. The Millenium series could have been a grittier crime show that slowly got audiences into the darkness of the crimes instead of throwing it in their face as movies do. 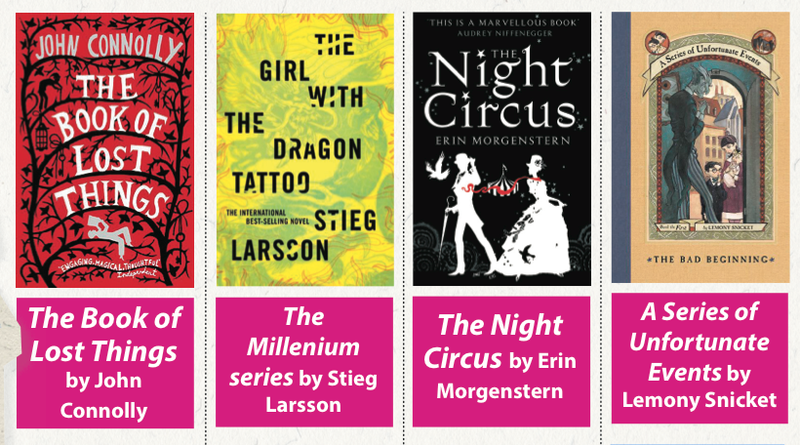 A must-read novel for any lovers of magic, The Night Circus focuses on the performers at the mysterious Le Cirque des Rêves which comes without warning and is only open at night. While the novel focuses on many aspects of the circus, including the group of people who made it and how it began, it also includes the story of Celia and Marco. A daughter and son of two rival magicians the two (who are children at the beginning of the novel) are prepared for a duel against one another when they reach adulthood, when they expectantly fall in love. The Night Circus is much more than just a romance and it would be the perfect book to adapt into a television show in order to see the different back stories that led Celia and Marco to the circus and how the circus has affected those who created it. This popular books series about the three Baudelaire orphans who deal with one tragedy after another had a majority of fans disappointed with the movie adaption in 2004 that combined the first three books into one movie. The main complaints towards the movie stemmed from the fact that the movie was more comic and light- hearted than the dark themes of the book which held more of a dark edge (the books are definitely an acquired taste). Had the books been adapted as a television series, audiences could have had the chance to understand the Baudelaire orphans as individuals rather than as a group. As well there would have been more time to explore the mysterious past of the Baudelaire’s family and their numerous relatives (whom the orphans had never met before the deaths of their parents) which was only briefly hinted at in the movies (what was with that spyglass anyways? ).